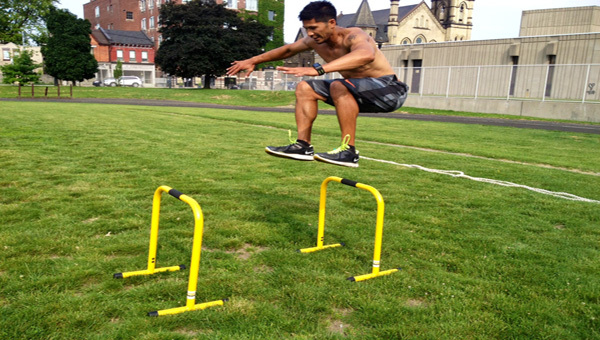 Jumping is an explosive exercise that requires leg strength. It is popular in athlete training. The movement is common in many sports, so athletes must be very efficient at this movement. It can be applied to literally any training program for health, cardio, or fat loss benefits. To jump you dip your hips into a quarter squat position with your arms straight behind you. As your legs quickly contract and straighten, your arms should shoot directly above your head in order to give you momentum. The goal is to get as high as you can off of the ground as quickly as possible.